One is hard-pressed these days to wander through any high street without seeing a comprehensive selection of decorative hares in shop windows. These ornaments come in all sorts of materials including bronze, concrete and ceramic, to suit any domestic location. Faced with these serried ranks of hares, I must admit to feeling cross, for at least two different reasons. 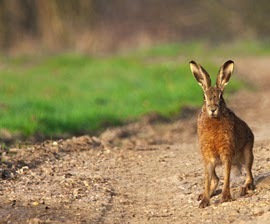 The more admirable of the reasons is that hares are a beautifully elusive animal. They are a ‘look, look!’ moment for us when we occasionally see them crossing the country lane on the school run. They are a special gift on a walk, usually in the predawn light or the glow after sunset. They appear only for a second, and you have to look with all your eyes, and soak up what you can of their grace and alacrity while they are within view. Of course it is not wrong to try to capture the specialness of something fleeting and rare, to express some of its power or talent in a painting or a poem or a photograph. But the mass production of this animal is, I feel, completely inappropriate. It seems to Disnify the hare, which up till now had retained some of the mystique and respect that being judged the familiar of witches for centuries will give you. Until this recent trend, the hare had dodged the gaze of modern infantile culture, all huge eyes and puppy dog appeal. Just think of what has happened to the meerkat and you will see what I mean. I am also miffed because, feeling around in the early stages of my Medieval novel (over four years ago now) for an appropriate title, I lit upon “A Hare for the Hunter”, which then very quickly sounded like I was jumping on the hare bandwagon. For that, and other reasons, the title had to go. In my story, the hare is a symbol of the heroine, who is pursued and has the narrow escapes common to this animal. There are other similarities as well. Hares in medieval times were considered to be hermaphrodites, and in my story the heroine is forced to dress as a boy in order to travel safely. Hares were ambiguous, having multiple symbolic currency. http://www.ruthpadel.com/hare-hunted-hare-magic-hare-tamed/ They could be associated with the devil, as they were thought to be promiscuous as well as nocturnal, creeping along the margins of fields and human habitations, (there were many recommended charms for deflecting the bad luck they could bring on the viewer http://bourguignomicon.blogspot.co.uk/2010/08/names-of-hare-anonymous-middle-english.html). There was also the mad behaviour of the hares in the spring, which associated them with lack of reason. On the other hand, according to the Medieval Bestiaries, they could be a symbol of the faithful christian who fears God and puts his trust in him. 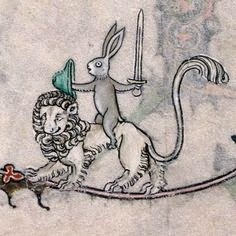 But there is another wonderful use of the hare in Medieval Manuscripts, in the tradition of the world turned upside down. The artistic reversal of the accepted order of the world was an important pressure valve in hierarchical Medieval society. Those in power are shown in positions of weakness, and the weak are made strong. The self righteous are shown to be sinful, and the crude are given positions of piety. So we see the hare taking up weapons and hunting men. 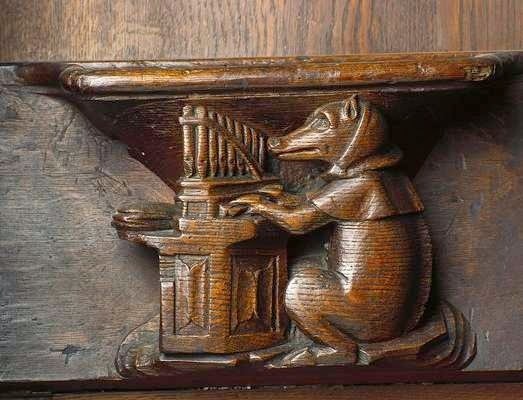 Most of these images appear in the margins of manuscripts or in misericords in churches (so were placed under people’s bottoms!). They are a subversive language of rebellion. They pricked the proud, and raised up the humble and hunted. It was that sense of the underdog being finally triumphant that I wanted to express in my novel. And so if I could make a coat of arms for my heroine, and for young women living in other oppressive societies, it would be the hare in triumph. In a world that values strength and status backed up by violence, a world principally dominated by men, the strategies of the hare are important. Be alert and quick to get out of danger. And, above all, don’t get caught. is immobility and earth brown fur. of their doe or death equally well. to launch the arrow of precarious life. switchback, tangling her scent trail. she suckles them sitting up. Ear tips twitch. Nose dilates. the stink of a vixen in the wind. running before the talon, tooth and wheel.